WASHINGTON (AP) — Time growing short, President Donald Trump and Republican Senate leaders dove into a frantic hunt for votes Tuesday in a last-ditch effort to repeal and replace "Obamacare." The pressure was intense, the outcome uncertain in a Capitol newly engulfed in drama over health care. Senate Majority Leader Mitch McConnell, whose failure to pass an Obamacare repeal bill in July opened a bitter public rift with Trump, pressed hard for the newly revived effort, which had been left for dead as recently as a week or two ago. But in a sign he remained short of votes, McConnell refused to commit to bringing the legislation to the floor. As in July, much of the focus was on Arizona Sen. John McCain. Would he step back in line with fellow Republicans now that there was a bill co-written by Lindsey Graham of South Carolina, his best friend in the Senate? McCain wasn't saying. Lisa Murkowski of Alaska, another crucial vote, wasn't disclosing her views either. Republicans must act by Sept. 30 in the Senate, or face the prospect of a Democratic filibuster. That blocking action is currently staved off by budget rules that will expire at the end of the fiscal year. 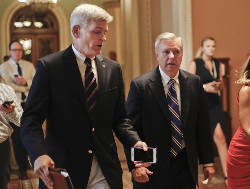 The new legislation, by Graham and Sen. Bill Cassidy of Louisiana, would undo the central pillars of former President Barack Obama's health care law, and replace them with block grants to the states so they could make their own health care coverage rules. "Senator Murray and I had hoped to agree early this week on a limited, bipartisan plan to stabilize 2018 premiums in the individual health insurance market that we could take to Senate leaders by the end of the month. During the last month, we have worked hard and in good faith, but have not found the necessary consensus among Republicans and Democrats to put a bill in the Senate leaders' hands that could be enacted." "Governors and state legislators of both parties would have both the opportunity and the responsibility to help make quality and affordable health care available to their citizens in a way that works for their own particular states," McConnell said on the Senate floor. "It's an intriguing idea and one that has a great deal of support." Democrats are unanimously opposed, arguing that the legislation would result in millions of Americans losing their health insurance, decrease access to affordable care and damage the Medicaid health program for the poor. So McConnell must win the votes of 50 of the 52 Senate Republicans. That would amount to victory in the 100-member Senate, because GOP Vice President Mike Pence would then break a tie. Pence appeared at the Capitol Tuesday and declared the Trump administration was "all-in" on the effort. The president himself was closely in touch with Graham and others. If the bill does pass, Speaker Paul Ryan has committed to pushing it through the House as-is, and straight to the president's desk, according to Graham. After seven years of promises to get rid of "Obamacare," Republicans would have finally succeeded. It would be a promise kept to the GOP base, yet one with uncertain and potentially devastating political consequences for the Republican Party given that millions of people would be likely to lose their health coverage and others might have skimpier care. The bill would let states set their own coverage requirements, allow insurers to boost prices on people with serious medical conditions, end Obama's mandates that most Americans buy insurance and that companies offer coverage to workers, and cut and reshape Medicaid. The bill's full impacts are difficult to predict since the Congressional Budget Office has not had time to assess it. But senators plan to move forward without a complete CBO "score," heightening outrage from Democrats. The situation is nearly identical to where Republicans found themselves back in July when McConnell made one last attempt to pass a stripped-down repeal bill. It failed in a tense late-night session, with McCain, newly diagnosed with brain cancer, casting the decisive "no" vote. McCain finds himself once again at the center of the drama this time around. But now there's a twist: His best friend in the Senate, Graham, is an author of the bill. McCain has been more more than willing to buck his party's leadership over the years, and to defy Trump. Undercutting Graham might be a different issue, and McCain brusquely refused to tip his hand Tuesday. "I don't have anything to say," McCain said repeatedly and snapped at a reporter who pressed for more. "I have nothing to say, do you hear me?" Graham made clear he was arguing the case forcefully to his longtime friend, with whom he's partnered on any number of policy initiatives over the years and rarely parted ways. A hearing on the legislation was scheduled for next week after McCain had complained there weren't any. "I'm not speaking for Sen McCain. 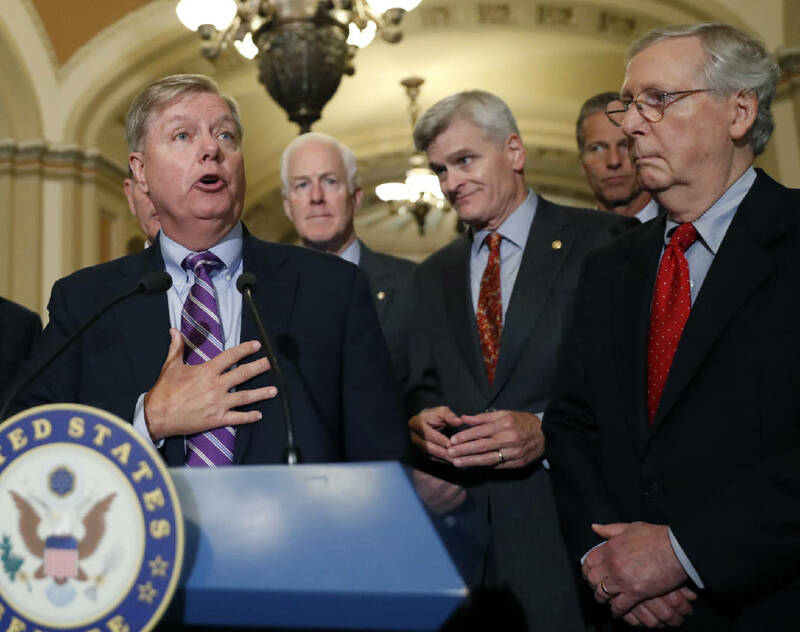 I know he likes federalism, I know he wants bipartisanship, but I just don't personally see a bipartisan proposal that's got a snowball's chance in hell of doing anything other than propping up Obamacare," Graham said. "It's either this or a march toward Bernie-care," a reference to Sen. Bernie Sanders' Medicare-for-all bill. GOP Sen. Rand Paul of Kentucky has announced his opposition to the legislation, saying it doesn't go far enough in repealing "Obamacare," while moderate GOP Sen. Susan Collins of Maine, who opposed earlier repeal bills, also sounded like a "no" Tuesday. She said the Graham-Cassidy bill could be worse than earlier versions because of potential harm to people with pre-existing conditions. In addition to McCain, the focus was on moderate Murkowski, who was the third "no" vote on the earlier bill along with Collins and McCain. Murkowski kept a low profile Tuesday but in what could be a significant factor for her, Alaska's independent governor, Bill Walker, joined a bipartisan letter with other governors in opposition to the bill, asking senators to instead focus on bipartisan approaches. A pair of potent interest groups, the American Medical Association and AARP, also declared their opposition. 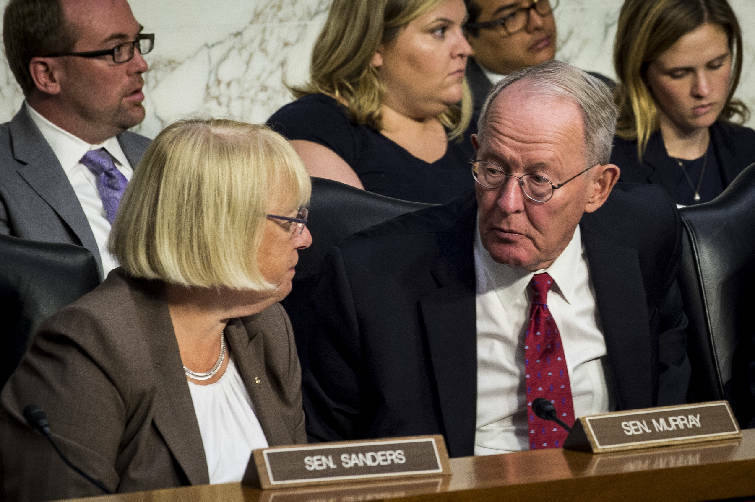 But the prospect for any kind of bipartisanship appeared to die out altogether as GOP Sen. Lamar Alexander announced he had not found consensus in his attempt for a limited fix for existing health marketplaces; his Democratic partner Sen. Patty Murray accused GOP leadership of freezing their effort.